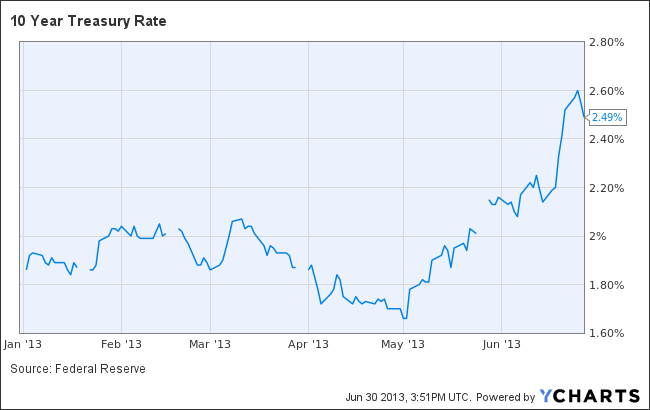 The market has its eyes on Bernanke’s “tapering” of quantitative easing. Should the Fed taper its bond buying, rates will inevitably head higher as the supply of dollars chasing fixed-income investments will dwindle, forcing rates higher to lure more loanable funds. Insurance companies are some of the few beneficiaries of higher interest rates. Insurance companies receive premiums, which are effectively prepayments on future insurance claims. Since claims are often made months and years after premiums are received, insurance companies generate a “float,” or interest-free money which they can invest in short and long-term securities. I’ve long thought that insurance companies are comparable to utilities, and a fine substitute for bonds. While there is no legal force ensuring the profitability of the insurance business, over its long history the insurance business has generated substantial returns for value-oriented investors. Because insurers invest their float in a combination of stocks and bonds (usually 90-95% bonds and preferred stock and 5-10% common stock, the allocation with the highest low-risk returns), a play on insurers is really a play on bonds. However, unlike a bond fund, which will lose value as rates rise, an insurance company will see rising earnings as new premiums are reinvested into new, higher-rate securities. To demonstrate that point, consider that a $1 billion purchase of 10-year U.S. Treasuries today would earn $25 million per year, vs. $17 million for the same investment in April 2013. In just two months, a slight bump in the 10-year yield added 50% to fixed-income profitability. The three most liquid insurance ETFs are SPDR KBW Insurance ETF (KIE), iShares Dow Jones US Insurance Index Fund (IAK), and PowerShares KBW Property & Casualty Insurance Portfolio (KBWP). The KBW Insurance ETF and Dow Jones Insurance Index Fund purchase common stock in insurance companies of all types: property and casualty, life insurance, personal and commercial, and insurance brokerage companies. These ETFs also hold firms which engage in riskier financial insurance – companies like AIG which earn a substantial amount of income from underwriting derivatives and financial contracts. The PowerShares KBW Property & Casualty Insurance Portfolio is focused exclusively on less risky insurance companies that write car and home insurance, as well as insurance against commercial property. Property and casualty firms differ substantially from other insurance companies. First, property and casualty insurers invest their float in shorter maturities. Car accidents (a risk P&C firms take on) happen far more frequently than a death (a risk life insurance companies endure). Secondly, the risks are more predictable than risks to long-term insurance contracts. Finally, and perhaps most importantly, P&C companies do not substantially inflate their book values with deferred acquisition costs (up-front costs to acquire a customer amortized over the expected life of a contract) like life or disability insurance underwriters do. P&C book values are as stated, with little financial risk from early contract termination. Without question, ETFs that hold more life and financial insurers than P&C companies will see the biggest benefit from rising rates because the long-end of the curve is expected to rise faster than the short-end of the yield curve. Bernanke’s tapering would have a direct effect on long-dated U.S. Treasury and mortgage backed securities, not short-term T-bills or corporate credit. Does that make life insurers and financial insurers a better bet? Not necessarily. Insurers who write long contracts are very often a blackbox of complicated risks. When you insure long-term risks (such as mortality) or issue financial derivatives (such as interest rate swaps or contracts on the future value of the S&P 500) the risks are not easy to understand. Black Swans threaten forward earnings and solvency. There is no such thing as a Black Swan event for a geographically-diversified property and casualty insurance company. Said another way, actuaries can project with much better certainty the financial damage a legion of 16-year-old male drivers will create over the next 5 years than what the S&P 500 will be on a certain date 5 years into the future. For that reason, the PowerShares KBW Property & Casualty Insurance Portfolio (KBWP) is a best bet. Though it lags the two other insurance ETFs this year because of its exposure to short-end rates, it offers greater certainty than broad insurance ETFs. Top holdings like Chubb (CB) and Travelers (TRV) are well-regarded for their exceptional underwriting. Quarterly rebalancing keeps the fund in check, routinely slashing winners to go deeper in temporary underperformers. Bottom line: Investors can access a portfolio of 25 top P&C insurance companies trading at below average earnings multiples with the PowerShares KBW Property & Casualty Insurance Portfolio at a cost of just .35% per year. The upside is in higher rates, though at 1.07 times book value and with the average constituent earning an ROE of 11.1%, investors certainly don’t need higher rates to justify an investment. The insurance industry is one of my favorites for a value-oriented, long-term investor.